Flavor emulsions are used in many food products including carbonated beverages and dairy products. A typical flavor emulsion contains essential oils, emulsifiers, and stabilizers in an aqueous continuous phase. 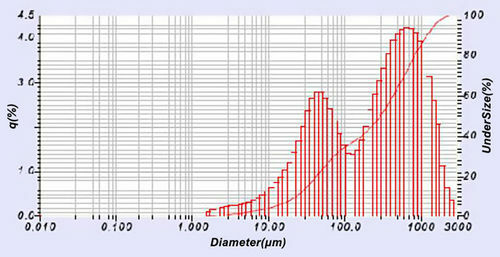 The particle size of the emulsions droplet is critical for stability. Given the sub-micron size range of most flavor emulsions, the size analysis can be performed with either laser diffraction or dynamic light scattering (DLS). DescriptionFew products are so involved in particle sizing from start to finish as coffee. From the classification of the raw, green coffee bean to the relationship between brew quality and the size of ground coffee beans, the quality of the final coffee drink is directly related to particle size and sometimes shape and density as well. The CAMSIZER dynamic image analyzer and LA-960 laser diffraction analyzer offer undeniable advantages in measurement accuracy, quality, and speed over historic sieving techniques. DescriptionParticle size measurement of chocolate samples is a vital factor in producing a consistent and attractive final product. Several stages of manufacturing are controlled by particle size and the particle size of cocoa powder used in chocolate affects color and flavor strength. DescriptionThe classic ingredients of mayonnaise; oil, eggs, vinegar and salt, contain a high number of calories. In an effort to reduce the fat content, manufacturers have either reduced or substituted ingredients in an effort to appeal to a more health conscious society. It is interesting to note that unless the product contains over 65% oil, The U. S. Federal Drug Administion rules that it cannot be called mayonnaise. In these cases, the product will be named either ‘mayo’ or ‘dressing’. This application note reviews the important role that particle size plays in the formation of mayonnaise and mayo products and how changes affect the taste and consistancy of these alternatives. DescriptionMilk is the drink of champions. And think of all the permutations. Chocolate milk, strawberry milk, and of course, lattes and cappuccinos. What would we do without it? But without homogenization, the milk’s quality and consistency are sacrificed. Milk is an emulsion that is often homogenized to reduce the average particle size. That improves its consistency and extends its shelf life. The homogenization process is expensive, but careful control of the process can improve quality, and thus, reduce operating costs. That’s where particle characterization comes in. DescriptionSugar is a basic food commodity and hence each country has a well-developed sugar industry. Monitoring a product’s physical properties, like particle size distribution, is of utmost importance in maintaining consistent quality, and often determines whether the product is accepted or rejected. The use of the CAMSIZER® digital image analysis system is a useful tool to achieve production optimization in sugar manufacturing. DescriptionFlavor emulsions are concentrates used for food products. The flavor could be a natural product or a synthesized material, emulsified to make delivery easier. Particle size analysis is used during the emulsification process to ensure optimum sizing of the droplets and during stability studies to identify any creaming (coalescence of droplets) due to an unstable dispersion.